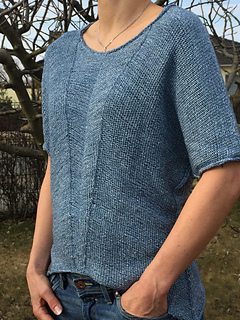 Nami is designed with a yarn which appears and behaves very unusually. 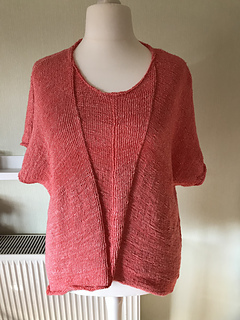 ITO Mizu is an untwisted cotton yarn. While running through the dye bath, the strand absorbs the color superficially. The color is fixed just slightly afterwards. While knitting, the color breaks open, and the raw white cotton strand becomes visible, giving the yarn a used look. Dye will transfer to your fingers while knitting, but can easily be removed by washing your hands with regular soap. While soaking my sample, dye transfer had been less an issue as with other handdyed yarns I used before – so no worries! 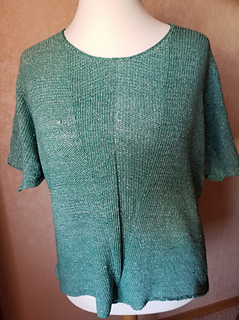 The inherent twist of the yarn creates a warped fabric which I used to shape the design without incorporating short rows. If using a balanced yarn for this pattern, you won’t get the pictured look. Intended to be worn with zero ease around hips. 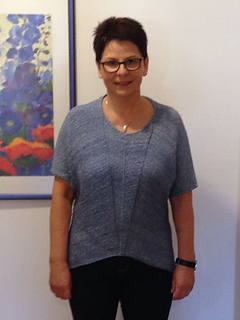 Sample is shown in colorway 621 Denim in size L on a 102 cm/ 40” mannequin with zero ease around hips. I recommend working a swatch with half the number of sts in stockinette and the other half in reverse stockinette stitch. 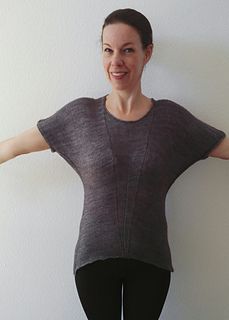 Pattern has been test knitted and proof read.